Thank you for expressing an interest in the Jesse H. Jones Memorial Building (JHJMB). We look forward to servicing your event. The JHJMB is designed for your convenience and to fit almost any budget. Our hours for showing are Tuesday & Wednesday, 10am – 2pm. If we cannot accommodate you during those times, we will be happy to try and reset another mutually acceptable time. Thank you for considering the JHJMB. We look forward to working with you. Please call our administrative office at 713-631-4385 to schedule an appointment or for more information. 1. GOG Ministry Organization: ongoing programs and special events. GOG ministries may reserve space up to one year in advance of an event. 2. GOG Members: Facilities will be made available to persons who desire to conduct weddings and funerals. These individuals have made a “commitment to the body”; this must be over a six-month period, and who desires to conduct weddings or funerals at the church. 3. Non-Ministry Organizations: GOG will allow non-ministry organizations to use its facility providing their mission and goals provide a positive impact to the community and will not hinder GOG’s ministry to the community. Non-ministry organizations may reserve space a minimum of three (3) months in advance of the event. 4. Non-Members: Facilities will be made available to persons who are not members of GOG. Willingness and desire to abide by the policy, procedure and guidelines must be noted in written form. 5. Non-GOG Ministries: Space will be made available to other ministry organizations. The Senior Pastor of GOG must approve each such use in order to validate that the guest organization’s Statement of Faith and Ministry does not compromise Greater Oak Grove’s representation of Christ to the community. Non- Greater Oak Grove Ministries may reserve space a maximum of six (6) months in advance of an event. 1. Users must comply with Greater Oak Grove’s requirements for the provision of technical services, staff and security. 2. 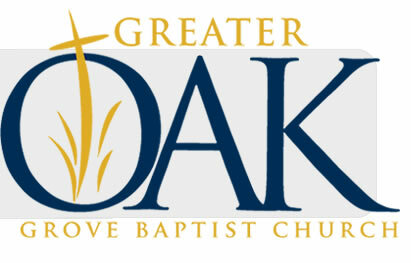 No use of Greater Oak Grove’s name and/or logo is permitted in any manner without expressed written consent of the Senior Pastor of Greater Oak Grove. 3. The Senior Pastor of Greater Oak Grove must pre-approve all event publicity. Final copy must be provided no later than two week prior to the first publication or broadcast. 1. It is the policy of Greater Oak Grove that all Non-Members and Non-GOG Organizations pay for the use of space. 2. Greater Oak Grove reserves the right to require advance deposits or prepayment of services provided. 3. Greater Oak Grove will provide a written estimate of costs for each event. 4. Greater Oak Grove will charge Members when the fellowship hall is used for weddings and outside special events. 5. Greater Oak Grove will not charge facility related fees for any funeral for Greater Oak Grove Members.